We love to take old tools and recycle them into something new. Welcome spring and your guests with a beautiful garden wreath – it’s easy to make and you are saving items from heading to the landfill. 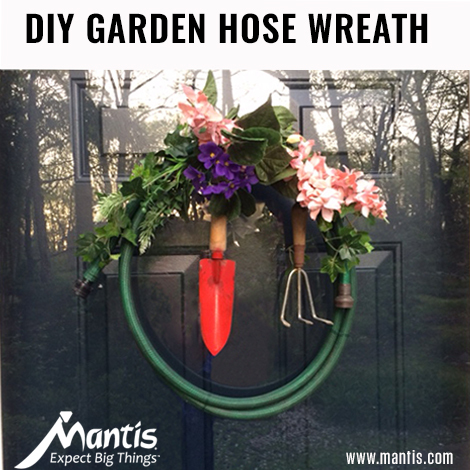 Step One: You can make your garden wreath as big or as small as you want it to be, so coil your hose the length you want it. Once you coiled your garden hose, tie it together using the florist wire. We recommend green florist wire so it will blends in with your hose. Step Two: Decide where to place your garden tools on your wreath. We used an old hand trowel, cultivator, and silk flowers for our wreath. Or use old garden gloves, small pots, seed packets, or small watering can. Step Three: Wire or hot glue the cultivator, trowel and flowers (or whatever you pick) onto your wreath. Step Four: Attach wire or heavy twine to hang the wreath on the door. Garden wreaths are easy to make using old tools and gardening items, plus they are super eco-friendly. What a great idea!! I make a lot of wreaths for different times of the year. I will start making this one as soon as it gets light out side, so I can find all the parts. Thanks for the idea. Yes, you can! They will also make a great gift…any time of the year!